More than 150 people were in attendance at the Ohio Power Siting Board hearing held Tuesday night at Whiteoak High School in Mowrystown. A total of 29 people offered testimony about the project with 22 of them expressing support. 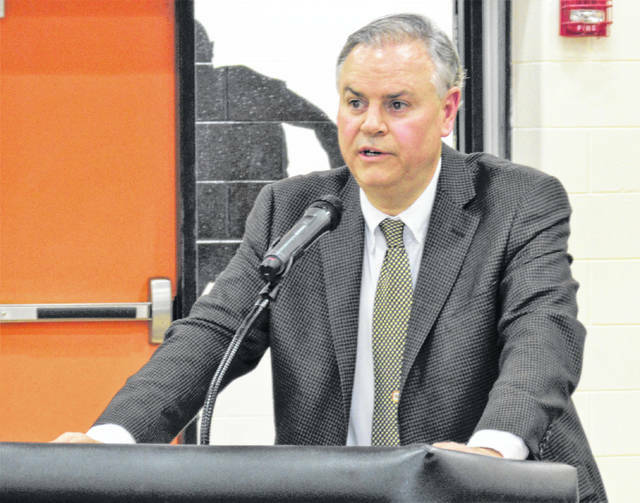 Mark Johnson, business manager of Tri-State Building and Construction Trades Council, offers testimony during Tuesday night’s hearing at Whiteoak High School. 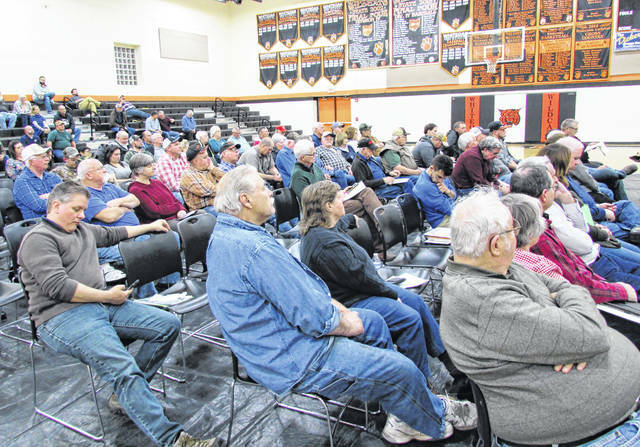 More than 150 people were at the Ohio Power Siting Board public hearing Tuesday night at the Whiteoak High School gymnasium, listening to 29 people express their feelings across three hours concerning the proposed 300-megawatt solar power generating farm Hecate Energy Highland, LLC wants to build between Buford and Mowrystown. The vast majority that were for construction of the 3,400-acre photovoltaic facility cited it’s perceived benefits, such as providing badly needed tax funds to both the Bright Local and Lynchburg-Clay school districts, the prospects of an influx of new jobs to the area, economic growth opportunities for Highland County, and from a farmers standpoint of being able to keep farmland in the family and pass it down to the next generation. The six people that expressed oppostion to its construction named several perceived detrimental issues such as the potential for increased soil erosion, excessive water run-off that could affect nearby wells, wildlife eradication, possible loss of jobs, health concerns involving cancer and respiratory illness, and a decline in property values that could bring with it the inability to sell property adjacent to the solar farm. Mark Johnson, business manager of the Tri-State Building and Construction Trades Council, told The Times-Gazette the new economy hasn’t been kind to Appalachia and Highland County. One of the evening’s most vocal critics was Mark Partin of Sardinia, who spoke on behalf of himself and 275 others who he said had signed a petition to halt the proposed construction effort. “My children like to play baseball and we’re going to be so close to the project they could pitch a ball right into a solar panel,” he said. He also asserted that there were improprieties with the petition papers, lack of public information regarding the proposed project in its early phases, and castigated American Electric Power, Hecate representatives and elected officials on both the township and county level. Another concern raised at Tuesday night’s meeting came from Jeffrey Wilson, president of the non-profit Friends of Serpent Mound, who addressed a suspected impingement of the solar farm on a little known small Native American mound in the shape of a serpent. Wilson was one of the 22 who testified in favor of the solar project, and added that if the site could be located he hoped it could be set aside so it could become a new tourist draw for the area, or at least be preserved as a state historical site. In his position at Serpent Mound, he said he was instrumental in mapping 95 other serpent-shaped mounds across North America. Dr. Evan Blumer, project director of the Appalachian Ohio Solar Job Network, said the next step in the process will play out during an adjudicatory hearing scheduled for 10 a.m. March 26 at the Public Utilities Commission of Ohio offices in Columbus.